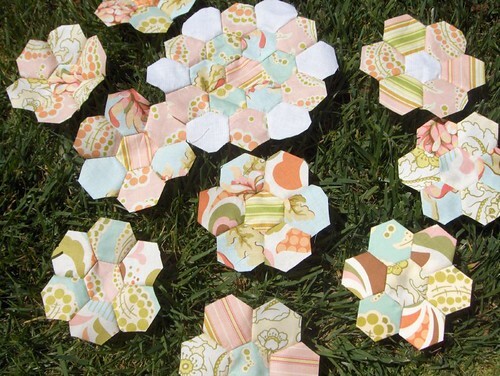 After seeing this super cute picture on flickr and reading her comment about her whip stitches showing, it reminded me that I wanted to revisit the topic of english paper piecing verses simply sewing your hexagons together. I’ve had hexagon templates available for download on here for a while now. I recently added a couple more sizes. I also added some triangles, but then realized that someone had requested diamonds, not triangles, so I’ll be redoing those :) But the triangles might be fun too – who knows? ANYWHOO…here’s what I wanted to talk about. After I went through all the trouble (actually, not much trouble at all) of making those templates, printing them, cutting them all out, sewing a bunch into fabric squares using Sunshine Creation’s awesome tutorial, I found that although it was very neat (as in precise, not neat-o), it was too double-the-work for my taste. 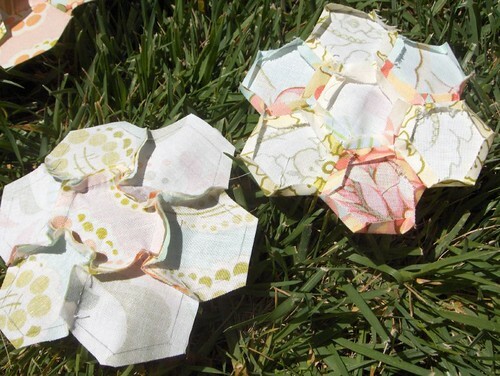 And when I went to sew together my perfectly neat little hexes with their papers inside, I could not hide the joining stitches, no matter how small my stitch, no matter what thread. Finally, I ended up just tracing the hexes onto the wrong side of my fabric. I pin them together and and sew along my pencil lines using a running stitch. Super fast and easy. I think I’ll do a tutorial of my own. Maybe tomorrow…with pictures! The back is a lot messier, but if you use a little Best Press or something, they’ll press right down. 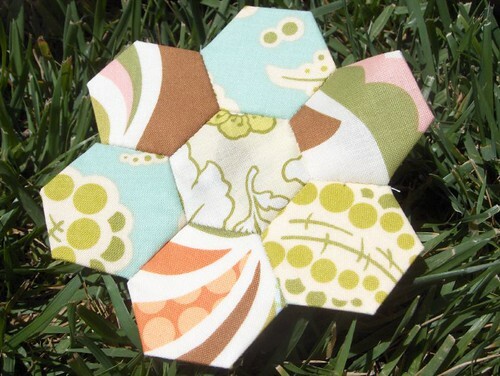 Hexagons are so fun and come out so cute, but the papers inside is so much EXTRA work (to me.) Once it’s all said and done, I don’t think you can tell the difference. The picture at the top has one english paper-pieced flower – you can tell because it’s edges are turned under (bottom right corner). Here it is below and I think you can really see the stitches, which is annoying. The last picture shows the differences in the backs before pressing. But again, I used a little Best Press, and had no trouble getting those seams to lay flat. All that work of templates has been the biggest reason I haven’t given hexies a try yet. Well, that and the whole “one stitch at a time with a needle in your hand” thing. But that I think I can get past. I love Best Press, but it’s so expensive compared to a can of spray sizing. I don’t like the aerosol can either, so when I heard of a homemade alternative, I jumped on it. As long as you don’t mind “wasting” the vodka, just put 1/2 cup of vodka in a 16 ounce spray bottle, add several drops of lavender or another essential oil, shake vigorously, then top it off with water and give it another shake. You can use distilled water if you prefer, but I don’t bother. This gives you crisp fabric when pressed, and it is also a great odor eliminator (think Febreeze). They use a vodka and water mix (no oil) in the costume department where I work instead of washing clothes after every show. An inexpensive home-made alternative AND an excuse to buy vodka! what more could I ask for! you’ll have to let me know if you dive in on the hexes…I think you’ll find that they are way less work than you envision. And keep a little vodka out for yourself, that can’t hurt! Thanks for stopping by!